Being a southpaw does have its fair share of advantages, but then again, there are also some disadvantages associated with being one. For instance, if you happen to be at a dining table during a sit down Chinese dinner, and everyone else is right handed, your left hand that wields the chopsticks will get in the way of the person on your left if he or she is right handed. 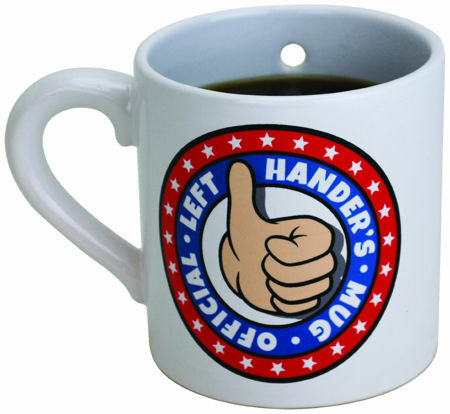 Well, utensils such as a drinking mug tends to cater to right handed folks, and so this $14.99 Official Left Hander’s Mug is worth checking out – with a caveat, too. There is a hole in one of the sides, so if you happen to hold the mug in your right hand and drink from it, your beverage will spill out through the hole.